I think this book merits a page of its own here. The market for piano technical books has always been a very small, niche market. They have not been able to benefit from the 'economy of scale' that brings down unit costs for items produced in large numbers. So piano technology books have always been relatively expensive, and uneconomic to produce in colour. Reblitz's excellent technical text, for example, is black and white throughout. Black and white photos are OK, but it can be hard to see parts very clearly when everything is in shades of grey, whereas red and green felt parts on light wood stand out clearly in colour photos. Haynes Manuals are aimed at a broader, consumer market. By producing a book that will be useful for all piano owners, as well as those with a deeper technical interest, it's been possible to produce a work in full colour throughout. This is a tremendous boon! Many of us are familiar with the Haynes Manuals, having bought them for cars. They are very thorough. For most of us, there is more information than would be needed. I was never going to pull an engine out and strip down the gearbox; but even finding out how to remove a piece of trim to access some component, would often justify the cost of the manual. In recent years, Haynes have branched out into other technical manuals, covering, for example, household appliances. 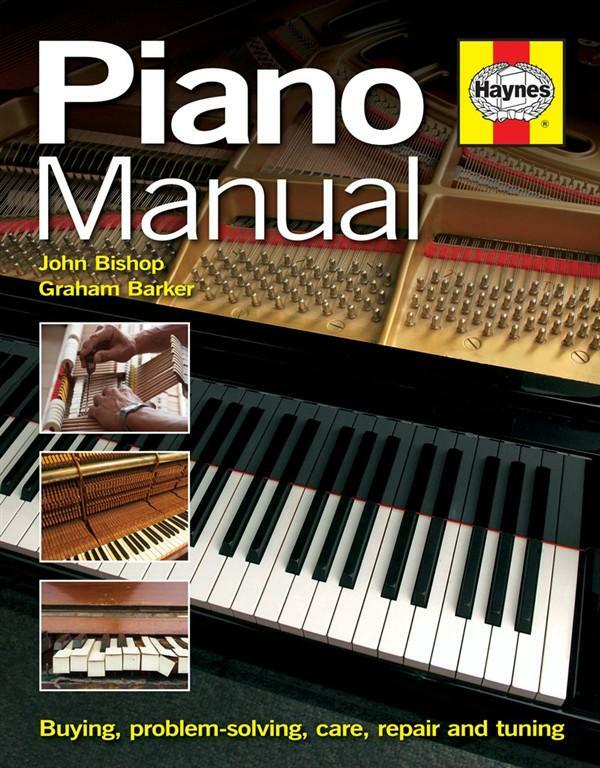 And now, the Haynes Piano Manual! John Bishop is a piano technician of some 35 years experience and also has a background as a University Lecturer (in an unrelated field). He and his writing colleague Graham Barker have produced a work that is copiously illustrated with colour photos and is accessibly and humorously written. There are different methods for carrying out many piano tasks, and not everyone will do things in exactly the same ways as described in this book. But that's fine. This is a genuinely useful Manual which I think should be in the hands of anyone who is at all interested in the workings of his or her piano. It would be especially good for piano students. Just as with the Haynes car Manuals, many tasks are described that most readers won't be intending to tackle, but the book is very much worth having for general background information. The scans reproduced here are included for review purposes, under the Fair Dealing provisions of the Copyright Designs and Patents Act 1988.